When dealing with molecules, we use oxidation numbers to indicate how many electrons an atom in a molecule tends to gain or lose. Any change in the oxidation numbers from one side of a reaction to the other is oxidation-reduction, or “redox” reaction. Such movement involves a change in energy of the electrons. Dealing with this change quantitatively is known as electrochemistry. In this chapter we will focus on oxidation states, oxidation-reduction reactions, galvanic/voltaic cells, as well as electrolysis and electroplating. When an atom becomes involved in a bond, the atom is either oxidized or reduced. But what do these terms mean? Well, any chemistry teacher will tell you that an atom that loses electrons is oxidized; an atom that gains electrons is reduced. They'll tell you to recite “LEO says GER,” which means Lose Electrons Oxidized and Gain Electrons Reduced. You should definitely remember that sentence for this exam. The only kind of reaction in which an atom truly loses an electron and another truly gains one is one that results in an ionic bond. But, as a way of keeping track of electrons, chemists assign each term in a compound a positive or a negative charge based upon the relative electronegativities of the atoms. For example, take HF. H-F has a covalent bond; F has a higher electronegativity value than does H. Although this isn't an ionic bond, chemists will assign the H a +1 charge and the F a –1 charge. These charges are called oxidation numbers and are always whole numbers. • The atoms in any compound can be assigned oxidation states. The charges given to the atoms are formal charges that reflect their electronegativities. • For any compound, the total number of electrons given up by atoms is the same as the number gained. Thus, the oxidation states of all of the atoms in a neutral compound always add up to zero. Each atom in a compound can also be assigned what's called an oxidation state. The oxidation state is positive if the atom is likely to lose electrons and negative if the atom is likely to gain electrons. If, for instance, we imagine that some atom has gained two electrons, its oxidation state is –2, and if it has lost one electron, its oxidation state would be +1. Since total reduction has to equal total oxidation for all compounds, the sum of all oxidation numbers of a compound is always zero. It is important to remember that we assign oxidation states to atoms only when they aren't in their elemental forms. For example, each atom of H2, O2, Cl2, N2, Na, or Fe has an oxidation state of zero. Atoms in all other compounds, such as those in H2CO3, CaO, or N2O, can be assigned an oxidation number that is not zero. On the SAT Chemistry Test, the writers might show you some compound or other and ask you to calculate the oxidation states of its atoms. If you remember a few simple rules, you'll always be able to answer these questions. For some elements, the oxidation state is almost always the same, no matter what compound they're sitting in, while for other elements, oxidation state varies depending on the compound. Here are the important points to remember. Remember those six simple rules, and you'll be able to answer the questions about oxidation state on the exam. Here's an example. What is the oxidation state for nitrogen in the compound nitrogen monoxide (NO)? Oxygen's oxidation number is –2; there's 1 oxygen atom in the molecule, so oxygen contributes a total reduction of –2. Since the total reduction (gain of electrons) must equal the total oxidation (loss of electrons), nitrogen must have an oxidation state of +2 (which means it has been oxidized, having lost two electrons). What is the oxidation number of carbon in iron(III) carbonate, Fe2(CO3)3? If Fe's subscript is 2 and CO3's is 3, that means the charge on Fe must be +3, and the charge on CO3 must be –2. The oxidation state of an ion is equal to its charge. So the oxidation state of Fe is +3. The total oxidation state of CO3 is –2. The oxidation state of oxygen is –2. Since there are 3 oxygen atoms in CO3, the total contribution by oxygen is –6. This means that carbon's oxidation state must be +4 so that CO3's total oxidation state is (+4) + 3(–2) = –2. Now let's consider how these oxidation states add to give the total oxidation state of Fe2(CO3)3. • Oxygen contributes total reduction of (3)(3)(–2) = –18. • Carbon contributes total oxidation of 3(+4) = +12. • Iron contributes total oxidation of 2(+3) = +6. So the oxidation state of Fe2(CO3)3 is (–18) + (+12) + (+6) = 0. This is just what we would expect. Each iron atom has lost 3 electrons, each oxygen atom has gained 2 electrons, and each carbon atom has lost 4 electrons. The losses equal the gains; total oxidation equals total reduction. In oxidation reduction or redox reactions, as reactants form products, one or more atoms are reduced while one or more other atoms are oxidized. If reduction occurs in a reaction, then oxidation must also take place. If one species gains electrons, another must have lost them. If we want to represent just the reduction or just the oxidation in a redox reaction, we write something called a half-reaction. On the left side of the equation, iron's oxidation state is 0 and hydrogen's is +1. On the right side of the equation, iron's oxidation state is +2 and hydrogen's is 0. So iron has been oxidized (each atom has gone from an oxidation state of 0 to +2, so each has lost two electrons), and hydrogen has been reduced (each atom has gone from an oxidation state of +1 to 0, so each has gained one electron). We can write two half-reactions, one showing the oxidation of iron and the other showing the reduction of hydrogen. Here they are. 1 iron atom loses 2 electrons and takes on an oxidation state of +2. 2 hydrogen atoms each gain 1 electron to yield 2 hydrogen atoms with an oxidation state of 0. Notice that if we take the two half-reactions together, oxidation equals reduction: In the oxidation half-reaction, iron loses 2 electrons. In the reduction half-reaction, 2 hydrogen atoms each gain 1 electron; the total electron gain is 2. • Hydrogen's oxidation state doesn't change (it's +1 on both sides). • Oxygen's oxidation state changes from 0 to –2. This means that nitrogen's oxidation state must change to balance the reduction of oxygen. • What is the change in nitrogen's oxidation state? On the left side of the equation, its oxidation state is –3 (to balance the total +3 oxidation state of the 3 hydrogen atoms to which each is bonded). On the right side of the equation, its oxidation state is +2 (to balance the –2 oxidation of the oxygen atom to which each is bonded). So its oxidation state changes from –3 to +2; nitrogen is oxidized. Here's the half-reaction that tells us what's happening to it. 1 nitrogen atom loses 5 electrons. You now know that reduction has to balance oxidation. The nitrogen atoms lost a total of 20 electrons; some other atoms must gain a total of 20 electrons. What gains electrons and is reduced? Oxygen does. Its oxidation state goes from 0 on the left to –2 on the right, and here's that half-reaction. Of the 10 oxygen atoms that have a –2 oxidation state on the right side, 4 are in NO and 6 are in H2O. The nitrogen atoms lose a total of 20 electrons, and the oxygen atoms gain a total of 20 electrons. Many important reactions are redox reactions. In a combustion reaction, a compound containing carbon and hydrogen reacts with molecular oxygen, O2, to produce CO2 and H2O. Look closely at the combustion of acetylene (C2H2), and you'll see it's a redox reaction. Carbon is oxidized and oxygen is reduced in this reaction. The rusting of iron is also a redox reaction. Here's a simplified expression of this process. As you can see, iron is oxidized, and oxygen is reduced. The result is that iron is converted into the reddish-brown iron(II) oxide, commonly called rust. There are two other terms that you should be familiar with: oxidizing agent (or oxidant) and reducing agent (or reductant). An oxidizing agent causes another species to be oxidized by undergoing reduction. A reducing agent—;by itself being oxidized—;causes another substance to be reduced. Consider the two redox reactions we examined earlier. In the first reaction, Fe (which is oxidized) is the reducing agent, and HCl (which contains the species being reduced, H) is the oxidizing agent. In the second reaction, NH3 (which contains the species being oxidized, N) is the reducing agent and O2 (which is reduced) is the oxidizing agent. Note that oxygen (O2) is an excellent oxidizing agent, and fluorine (F2) is also a powerful oxidizing agent. The active metals make strong reducing agents. Electrochemistry is the study of the relationship between chemical reactions and electricity. Here are the half-reactions and E0 values. For the above reaction, E0cell is 0.76 V + 0.34 V = 1.10 V. Since E0cell > 0, this redox reaction is spontaneous, which means that we can turn the energy that this reaction releases into electrical energy. But how? If we simply drop some zinc metal into an aqueous solution of Cu2+ ion (say, a water solution of Cu(NO3)2, this spontaneous redox reaction will happen. Electrons will leave the zinc metal as it is oxidized and be captured by the Cu2+ ions, which will be reduced. All of this will happen, yet we will get no electrical energy out of the reaction. Why not? Because the electrons will immediately travel from the zinc atoms to the Cu2+ ions. Electrical energy involves the flow of electrons, so if we want to derive electrical energy from this reaction, we must force the electrons that leave zinc to flow through a wire in order to reach Cu2+. This is precisely what the electrochemical cell does. In an electrochemical cell, the oxidation and reduction half-reactions occur in separate vessels. Each vessel contains an aqueous solution containing the ions participating (as reactants or products) in the reaction. For example, we can use Zn(NO3)2(aq) and Cu(NO3)2(aq) for the redox reaction shown on the previous page. A strip of metal called an electrode is placed in each solution; each electrode is made out of a metal that also participates in the reaction. The electrode in the vessel in which oxidation occurs is called the anode. The cathode is the electrode in the vessel in which reduction takes place. Each electrode is made out of a metal that also participates in the reaction. In our electrochemical cell, the anode is a strip of zinc metal, and the cathode is a strip of copper metal. As we mentioned, the anode and cathode are connected by an electricity-conducting wire. As electrons are freed by the oxidation process at the anode, they travel through the wire to the cathode, where they participate in reduction. This flow of electrons creates electrical energy, and it has been generated by the spontaneous redox reaction. Here's what an electrochemical cell will look like for the reaction between Zn and Cu2+. As electrons leave the vessel in which oxidation is occurring, a net positive charge accumulates in the vessel. A net negative charge grows in the reduction vessel, where the electrons are ending up. If these charge buildups were not neutralized, then the redox reaction would be short-lived, since electrons will not readily flow from a region of positive charge to a region of negative charge. So, what neutralizes any excess charge buildup? The salt bridge does. The salt bridge contains a cation and an anion that don't participate in the redox reaction. As positive charge accumulates in the oxidation vessel, anions flow into it from the salt bridge. Cations leave the salt bridge to flow into the reduction vessel and neutralize the negative charge buildup. 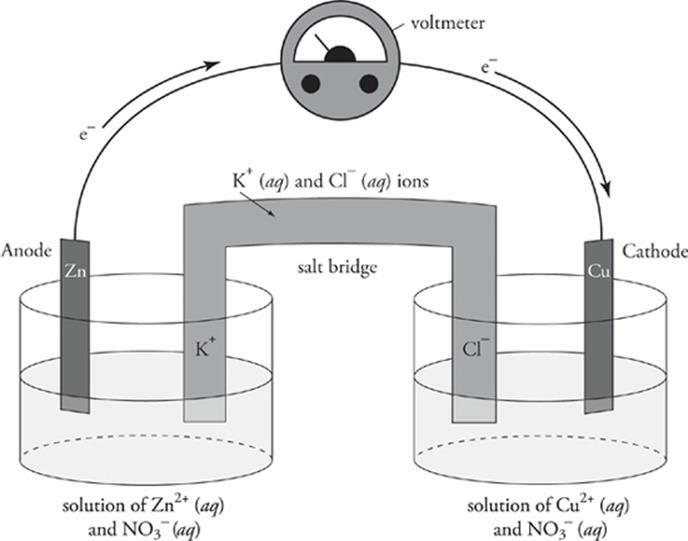 In our electrochemical cell, we would fill the salt bridge with an aqueous solution of potassium chloride (KCl). K+ ions flow into the reduction vessel, and Cl− ions flow into the oxidation vessel. Electrolysis is the process by which electrical energy is put into a nonspontaneous redox reaction to force it to occur. This means that, during electrolysis, electrical energy is converted into chemical energy. Electrolysis is a useful way to separate ionic compounds into their constituent elements. For example, running electricity through a sample of molten NaCl can produce sodium metal (Na) and chlorine gas (Cl2). Electroplating is a type of electrolysis in which one metal is deposited on another. For instance, a coating of silver can be electroplated onto a cheaper metal to make quality silverware. Galvanic Cells—;If the sum of the standard electrode potentials for the oxidation half-reaction and the reduction half-reaction is greater than zero, the reaction is spontaneous and the electrochemical cell produces energy. E0cell > 0 The reaction is spontaneous and energy is produced. Electrolytic Cells—;If the sum of the standard electrode potentials is negative, energy must be supplied to force the oxidation of negative ions and the reduction of positive ions, turning both species into the elemental forms. E0cell < 0 The reaction is not spontaneous and energy must be supplied. Review what we've said about oxidation-reduction and electrochemistry, and try the following questions. The answers can be found in Part III. Questions 11–14 refer to the following. Which of the following is true of the reaction given by the equation above? (C) Sodium is the oxidizing agent. (D) Both sodium and chlorine are oxidized. (E) Neither sodium nor chlorine is oxidized nor reduced. If 2 moles of Al and 6 moles of HCl react according to the above equation, then how many moles of electrons are transferred during the redox reaction? · An oxidation-reduction, or redox reaction, is one in which electrons are transferred. · Oxidation state, or oxidation number, tells how many electrons an atom in a compound has gained or lost. · Whenever atoms in a reaction undergo a change in oxidation state, a redox reaction has occurred. · The atoms that lose electrons are oxidized and are called reducing agents; those that gain electrons are reduced and are called oxidizing agents. · Standard electrode potential (E0) is the change in potential energy when a given element is reduced or oxidized. · Positive (E0) means the reduction or oxidation has released energy, and the reaction is spontaneous. · An oxidation-reduction reaction in which the sum of the E0 for both agents is positive can be used to produce electrical energy in a voltaic or galvanic cell. · In a voltaic cell, the element being reduced picks up electrons at the cathode. Electrons are coming out of solution and being plated onto the cathode. · The element being oxidized comes off of the anode and into solution as an ion, leaving electrons behind. Then these electrons travel through the circuit to the cathode. · Remember, AN OX and RED CAT. · A salt bridge completes the circuit, depositing anions into the oxidation vessel, where electrons are lost, and cations in to the vessel where electrons are gained, keeping both neutral. · In electrolysis, electrical energy is used to force an oxidation reduction reaction for which the (E0) is less than zero. · Electrolysis is a common way of separating ionic substances into the pure elements of which they are composed.